Since "Sharing with a Friend" was originally created with watercolors on illustration board, I decided to order a print of it on watercolor paper at the same size as the original. As you can see in the photo, this is a stiffer paper with a little curl, which can be remedied by putting it behind a mat, or glass. Of the two prints I bought for this artwork, I like this one the most. It is near identical to the original, slightly brighter, but with the added watercolor paper texture (as seen in the close up below). The details are clear and crisp. I'm highly pleased with how this one turned out. 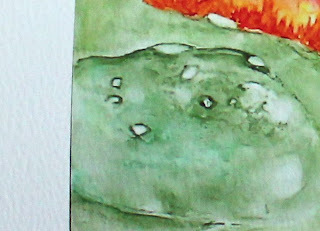 Close up of "Sharing with a Friend" print on watercolor paper. 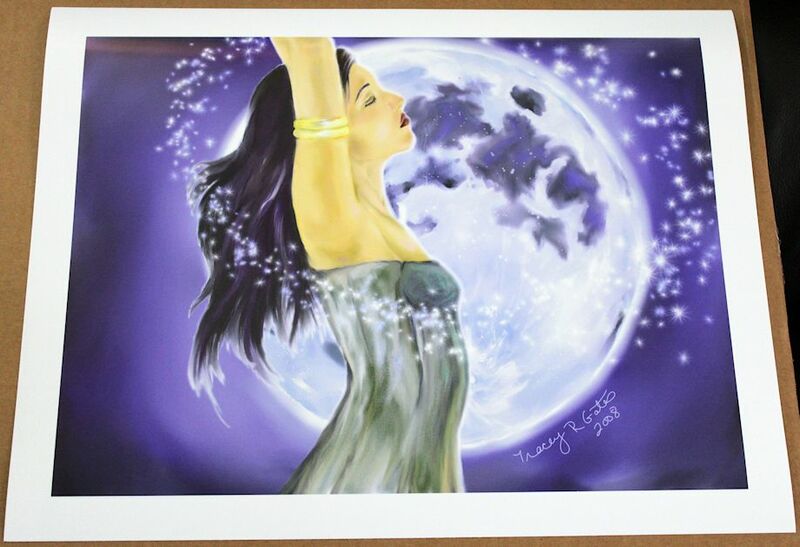 Last, but definitely not least, is the second print of Magical Moonlight. This one came out so beautiful. The photos of it do not do it justice. 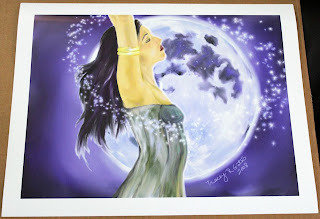 "Magical Moonlight" 16" x 12" on Epson Premium Glossy Photo Paper. It was printed on Epson Premium Glossy Photo Paper. The colors are rich, vivid. The paper itself is extra glossy. The moon and fairy dust really stand out. I'd say they almost glow. You can't tell by my photo, but the whites are brilliantly white. It's really a beautiful print. This one is my favorite of all four print papers/canvas. All in all, I'm impressed by the prints by Fine Art America and feel they are a great option for prints. I plan to try out their acrylic prints and gallery wrap canvas soon. I encourage artists - traditional, digital, photography - to try them. As long as you have a high resolution photo of your art you won't be disappointed. I have a gallery at FAA too. I'm glad I found your post. To be quite honest with you, I've never seen one of my own prints done by them. I have had the opportunity to talk to a few people who bought one of my works and they were happy with the quality and the service. Good to read a first hand view of how someones own work reproduced by FAA looks to them. Thanks for reading and leaving a comment. I had difficult time deciding which paper to have the art printed on until I requested samples of each. I really am impressed with how wonderful the art came out and the papers used. I wish I would have ordered them framed. 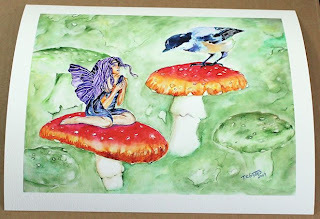 I plan to get a photo of the original fairy and chickadee painting side by side with the print on watercolor paper to show how close the print came. I'm not sure if the images show pixels when they get to the larger sizes. I think if you have an excellent image to begin with the prints will be perfect. Good luck with your art. See you on FAA! Thanks for sharing this review, Tracey. I'm on FAA, too, and was wondering about the quality of prints on the watercolor paper. I've ordered other prints there (all wonderful! ), but not the watercolor. I'm sure my print will turn out great. Thanks, again!